Posh striker Shaquile Coulthirst is a wanted man. Peterborough United have made transfer bids for two strikers. 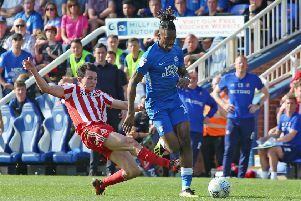 The club’s director of football Barry Fry today (January 17) revealed both bids have been rejected, but that fresh forwards have become a priority for the club in the current transfer window. Young Posh striker Mathew Stevens has joined Sligo Rovers on loan. Fry declined to name the players or the clubs involved. He said: “It’s frustrating for me and the manager, but clubs won’t sell until they have secured replacements. It’s likely there will be an awful lot of business done at the end of the transfer window. Posh let teenage striker Mathew Stevens join Irish League side Sligo Rovers on a six-month loan at the weekend. He played 45 minutes of a pre-season friendly on Saturday (January 14). Fry also claimed that Mansfield manager Steve Evans remains keen on Posh forwards Paul Taylor and Shaquile Coulthirst. Fry insists Taylor will not be sold as he remains part of manager Grant McCann’s plans. Posh insist Paul Taylor is going nowhere. Coulthirst would be allowed to leave on loan, but Posh would prefer a permanent deal. Coulthirst would prefer a move nearer to London. Evans declined to comment on the speculation, but he is known to be interested in more than one forward player.